The Kripalu charitable hospital in Mangarh has nine resident doctors. Dr. A.P. Das, M.S., Surgeon, Dr. U. Arora, M.D. Ob,Gyn, Dr. D.P. Singh, MBBS, General Medicine, Dr. S.P. Jana, M.D. Radiology, Dr. C. Patel, Homeopathy, Dr. Shalini Sharma, BHMS, Homeopathy, Dr. Sanjay Tyagi, NDDY, Naturopathy, Dr. Amrita Mishra, NDDY, Naturopathy, Dr. Lata Tyagi, NDDY, Naturopathy. The staff of the hospital includes 15 nurses and ward assistants, 8 pharmacy staff, 3 receptionists, 15 auxiliary staff, 8 naturopathy staff, 2 X-Ray and O.T. technicians, 2 lab technicians and 4 housekeeping staff. limited number of doctors available, the hospital has been forced to restrict the number of patients to be examined every day. A shelter has been constructed outside the hospital as a waiting hall for those who travel long distances and reach the night before with the hope of being first in line for the morning consultations. Approximately 400 patients are examined every day. In the first two years since its inauguration, 116,711 patients were examined of which 44,661 were new patients. Free allopathic medications are provided to approximately 200 to 250 Roughly 15,000 to 35,000 Rs. of medicines are distributed every day. 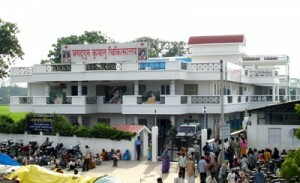 The hospital totally runs on the charitable support received from donations. Its annual running cost is Rs. 1.25 crores.patients daily, and free homeopathic medications are provided to approximately 150 to 200 patients daily.